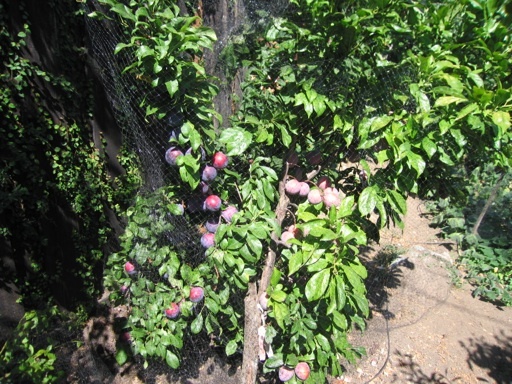 Our multi-grafted Japanese plum tree is full of plums right now. It’s a very small tree, about 5 feet tall and 4 feet wide. But it has over 100 plums on it. It has the most densely packed fruit of any fruit tree we have. It would benefit from thinning, because the branches can break under the weight of the fruit, but I didn’t bother to thin this year, because the fruit set was not as heavy as last year. The main grafts are the varieties Elephant heart and Laroda, which is the dark purple fruit in the picture below. The tree also has a graft of Nubiana, which is very small and doesn’t grow much, and Beauty. Most of the Beauty graft broke off two years ago under the weight of a heavy load of fruit. I cut off the remaining branches of Beauty, because I didn’t care for its flavor. The Elephant Heart and Laroda grafts are not self-fruitful, but both have managed to set a lot of fruit two seasons in a row without pollen from Beauty. Pollen from our pluot tree and a neighbor’s plum have probably helped. The Beauty graft was huge and on the verge of taking over the tree. The Elephant Heart and Laroda grafts have grown a lot since Beauty has been gone. 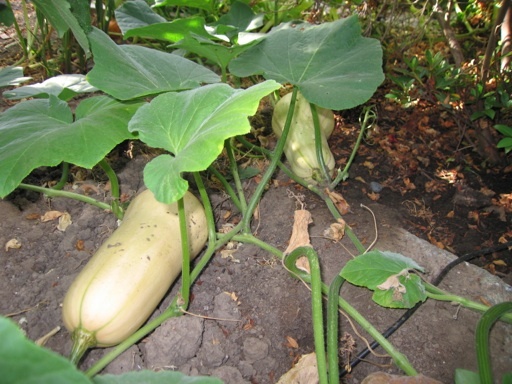 I really enjoy growing sugar pie pumpkins and butternut squash. I have found that they are both easy to grow from seed as long as they get regular water. I planted several groups of seeds last March. The vines are very long now and have set many fruits, even though I haven’t fertilized them. The vines can take up a lot of space, which is why I planted the seeds where the vines can grow in between our fruit trees. I planted them directly in the ground, not in our raised beds, because the vines would just grow out of the beds and across our paths between the beds. 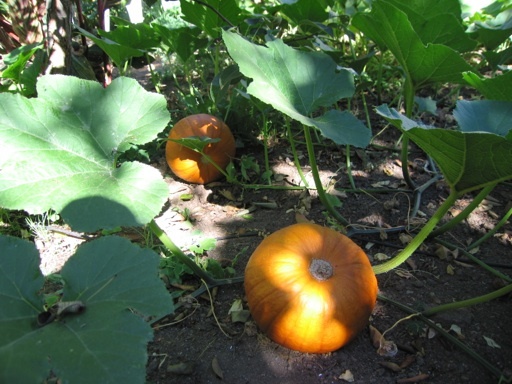 Some of the pumpkins have even grown roots directly from the vines into the ground. 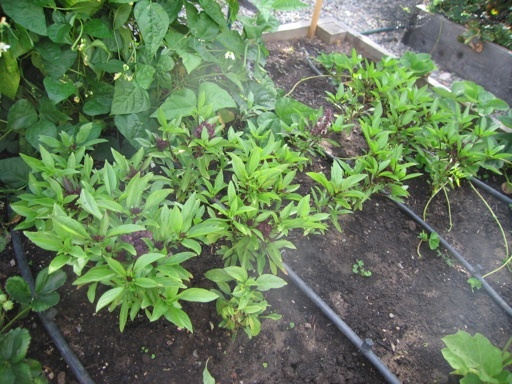 We are also growing Siam Queen (Thai) basil this year. I planted the seeds in pots in our mini-greenhouse in April and transplanted the seedlings into one of our raised beds in May. They only grow in warm weather, and it can get cold in April here. The plants grew slowly at first, but they are now starting to grow more rapidly. Their leaves have a strong scent that is similar to licorice, and their flowers are an attractive purple color. Also, they don’t seem to attract insects. 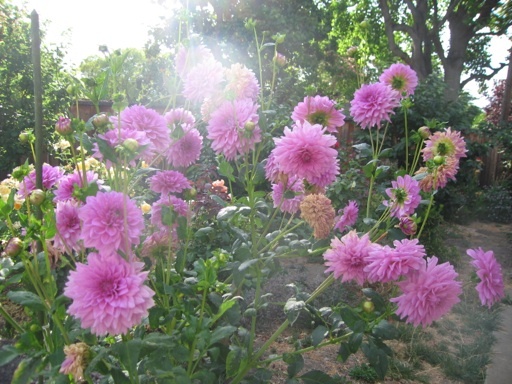 Our purple Dahlias have been full of flowers for several weeks. We are also growing them in raised beds where they get plenty of water and rich composted soil. Unfortunately, they are already getting mildew on their leaves, which happens every year around this time. 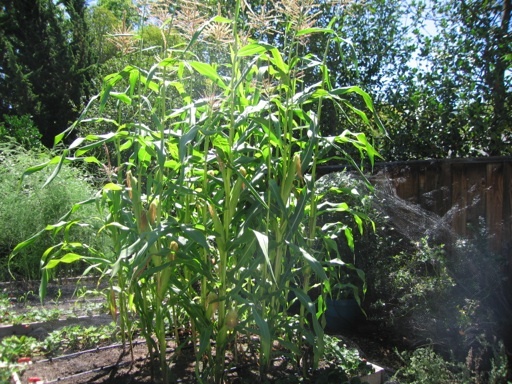 I planted corn seeds in mid-March this year, which is the earliest I have ever planted them. We almost never get frost here after March 1. I planted the peaches and cream variety, and ended up with about 18 plants. I always plant at least 15 corn seeds in a planting to ensure proper pollination. I started harvesting corn ears the first week of this month. They were very tasty. I harvested some of the last ears today. 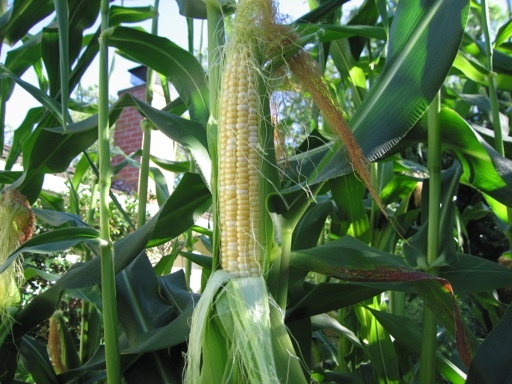 Several of the stalks had two ears, and a few stalks grew outshoots that themselves grew an additional ear of corn. I have more corn in another bed that I planted in June. They should be ready to harvest in October. 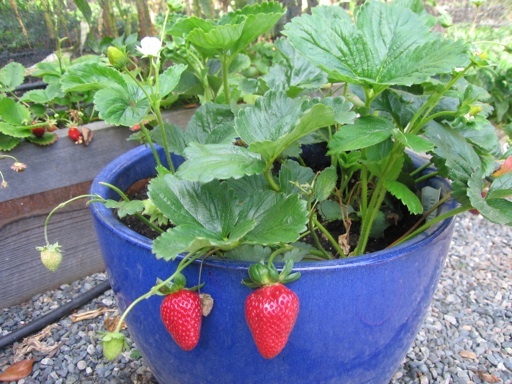 I planted Albion strawberries in pots with potting soil in May. I had not grown this variety previously. I have been picking strawberries from the Albion plants for over a month now, and they have exceeded my expectations. They have been continuously producing very sweet and large berries. They are much sweeter than Chandler, which are on the tart side in our yard. I think I will be planting more Albion strawberries in the future. So far the Albion plants have not produced many runners, unlike our Sequoia strawberries, which are prolifically producing runners right now.